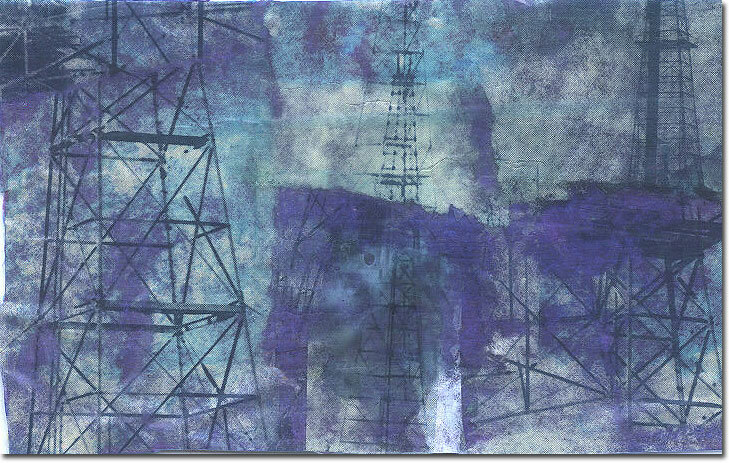 Blue Transmission Towers - Tape Transfer Collage 3.25" x 5"
And I thought, All that metal girding an ocean of conversations, incessant, invisible waves of communication. Certain towers have a distinct blue cast, the result no doubt of the chemical dip used to galvanize the metal bars. Overcast skies accentuate their subtle coloration. On such days they appear stalwart but sad, solitary figures on a barren landscape.